Much like your business, HoneyBook runs on Projects—they're the foundation on which we build our castle of awesome features. Within a Project, you can create and send files, email your client directly, track your time and tasks, and more. And when business is booming, you're going to need to add a whole lot of them. 1. From your HoneyBook dashboard, hover over the + New button in the top right corner of the screen. 2. Select New Project from the menu. 3. Enter your Project details: name, type, venue, date, lead source, etc. HoneyBook Tip: You can (and should!) customize your Project types to make sure they fit your brand. 5. Add a Participant to the Project by entering the email address, name, and any other relevant contact info you have. Participants are the contacts who will receive all files and other communication regarding the Project, so this will likely be your client! All participants that you subsequently add to the Project will receive all emails and files you send through HoneyBook. If you need to send an email or file to only one participant—or a certain subset or participants—you can create a related Workspace within the Project to do so. Your Project is now active! 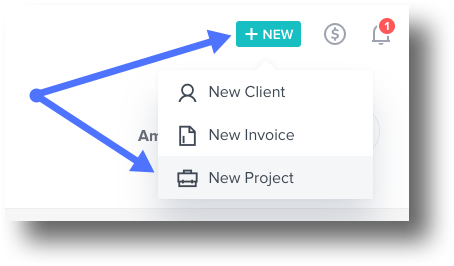 You can now create and send files, email your client directly through the platform, invite team members to collaborate, and oh so much more.